I was looking up Harry Potter showtimes like it was November 2010 and saw an option for "Fork and Screen." Looks like select AMC theatres have the option of having a full meal experience, including alcohollic beverages, while watching a movie! This is great for people who insist on dinner AND a movie but enjoy a little multi-tasking. Click here to scope the menu. Prices aren't as astronomical as regular concession stand mark-ups but I don't know if I'd order real meals from a movie theatre. They can barely get my cheesy nachos warm. I've always thought that they should serve dinner, but I never thought about the fact that they can't get nachos right, so what would make me think they could get a whole meal right? I loved it too! Soo good. 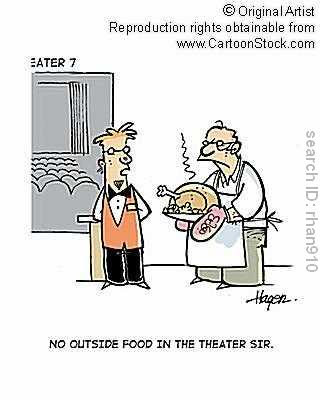 Also, for the record, the theater I visited serves dinner. They give you these trays that have a thing that sticks in the cup holder. All kinds of different food, too. P.s. do I still get to read that book?